cgTERMINATORMAP Draws map with day/night terminator displayed. 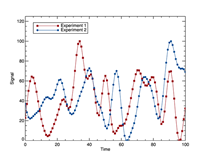 cgZPLOT Zooms into line plot with rubberband selection technique. MAP_GSHHS_SHORELINE Draws shorelines using the GSHHS data base in manner of MAP_CONTINENTS. PRECIPMAP Demonstrates how to fit a map coordinate system to a map-projected image. 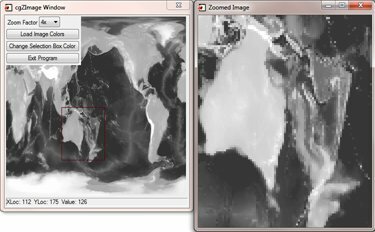 READ_TOMS_AEROSOL Demonstrates how to overlay satellite imagery on a map projection. 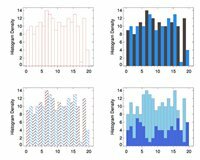 WINDBARB Plots meteorological wind barbs. 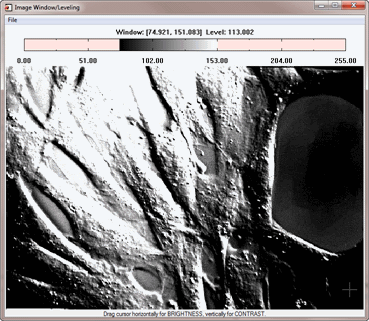 WINDOWIMAGE Interactively change the contrast and brightness of an image using direct graphics. 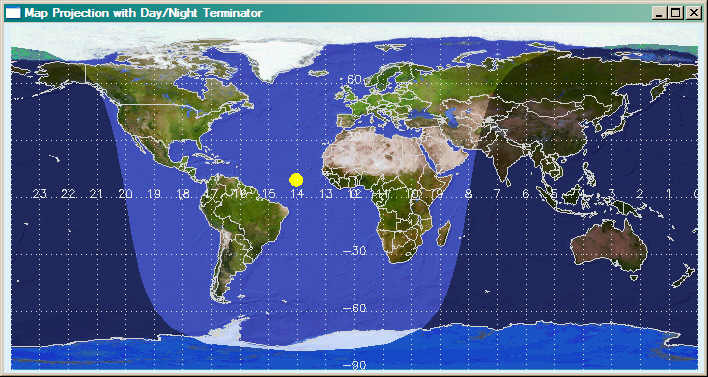 This program demonstrates how to calculate and draw a day/night terminator on a map projection. 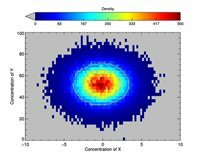 It requires programs from both the Coyote Library and the Johns Hopkins University Applied Physics Lab (JHUAPL) IDL Library. Users can specify seven different map projections, as well as the date and time of a particular view. Some people prefer the higher precision of the Global Self-consistent, Hierarchical, High-resolution, Shoreline (GSHHS) database for drawing continental outlines and other shorelines to the built-in CIA database that comes with IDL. 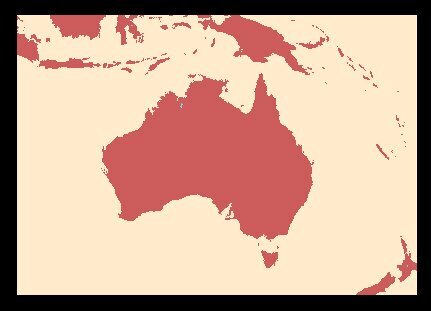 This program works in way analogous to MAP_CONTINENTS, in that it allows the user to draw shoreline boundaries into a map projection space set up with either MAP_SET or MAP_PROJ_INIT. You see example output below from running the program with the highest resolution GSHHS file. Detailed instructions for using this program are described in an accompanying article. This program is strictly a demonstration program to illustrate how to create a map coordinate system on top of an image that is already gridded into a map projection. It uses a precipitation image that is gridded into a polar stereographic map projection. 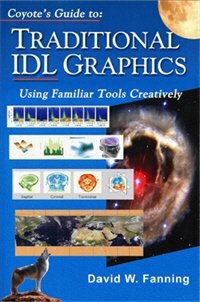 This program is strictly a demonstration program to illustrate how to overlay satellite data onto an IDL map projection in a device-independent way. That is to say, the output of the program should look identical (as much as is reasonably possible) on the display and in PostScript output. 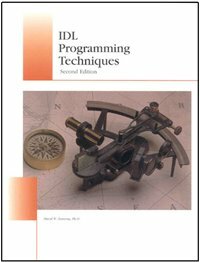 The program is discussed in detail in this tutorial article. Output of the program looks similar to the image below. 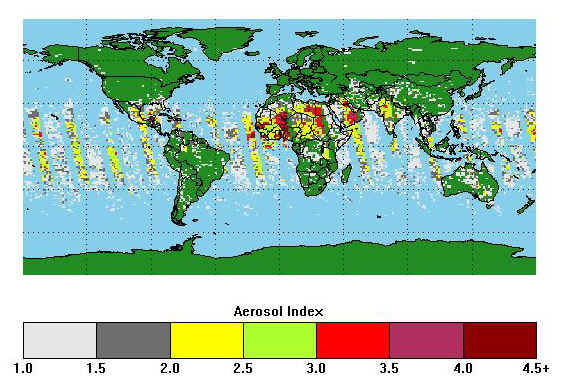 This program allows you to plot meteorological "stations" on a map project or other plot. See the WINDBARB program below for a picture of what station plots look like. This was written primarily to be used by the WINDBARB program. 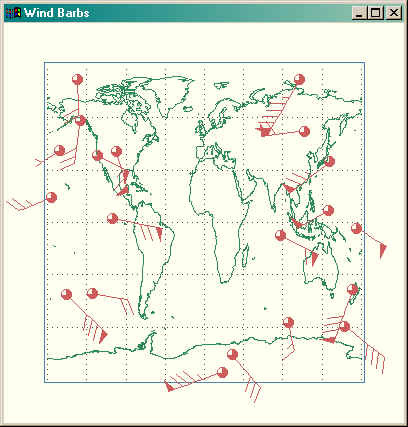 This program allows you to plot meteorological wind barbs on a map or other graphical display. Wind barbs show the direction and speed of the wind at a particular location. 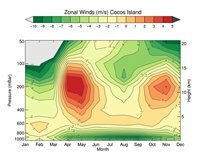 The figure below shows wind barbs plotted along with station plots on a map projection. 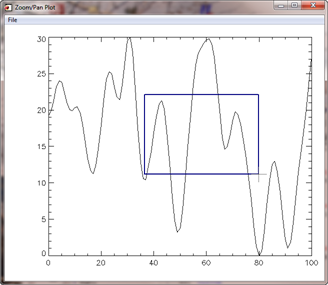 To plot stations, you will require the StationPlot program, too. This program demonstrates how to write a program to interactively change the contrast and brightness of an image. This is sometimes called the window level and window width. This kind of interaction is often required when working with 16-bit medical images. Details of the algorithm used in this program can be found in the article Image Contrast and Brightness Adjustment.